This question comes up on a regular basis; When doing a gun disarm should we hit our opponent as we attempt to disarm him or not? 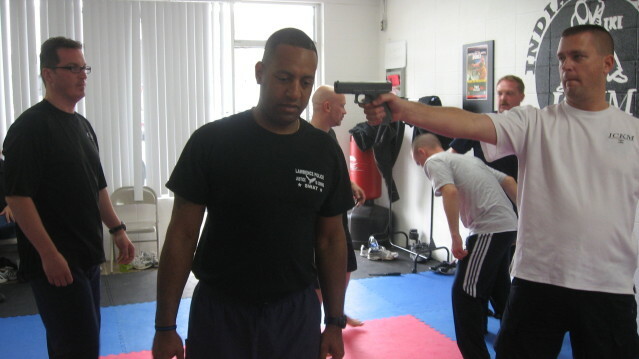 This is one of many areas where IKI Krav Maga differs from conventional Krav Maga. 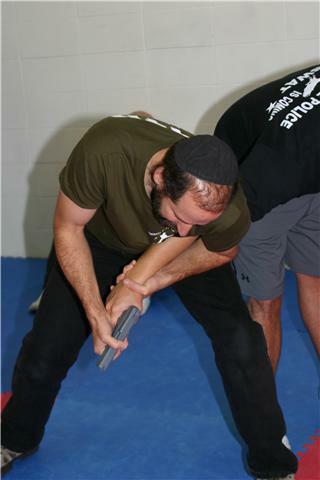 In many popular styles of Krav Maga and other off shots of the Israeli self defense art, we see, with both gun and knife disarms, the following situation; the defender blocks or grabs the weapon and then hits the attacker in the head. Here is my answer. It is a very simple answer and one born out of real life testing by many people. A human being can absorb a great deal of pain. How much pain is necessary for someone to comply? There is no answer to that. I have heard stories about people who were very badly beaten by cops or soldiers and still did not submit. I have heard stories about people being hit with batons and told to sit, but they did not sit until someone shot them in the knees. I have heard stories about people receiving repeated blows to the head, yet not submitting. Regardless of whether one uses simultaneous counter attacks with redirection or not dealing with a gun wielding attacker is a gamble! I think on this we can all agree, yes or no? Then why would I risk the possibility of turn any part of the odds against me. Where my life is in danger, I owe it to myself and those who love me to put every effort into getting home safe. By using s single hand to grab a metal object and then putting force into the one holding the object will likely drive that object backwards, correct? If that object holding the metal object is say 175 pounds and I have added inertia to that 175 pound object, is my one hand going to be strong enough to keep a grip on the metal object? Will I be fast enough to react to the backwards inertia to keep the gun redirected in a same muzzle direction? Can I do all of this while under the largest adrenal dump of my life and still be coherent enough to pull off a disarm at waist high? These are all things which erode the odds which could be in my favor. Ad things like exhaustion, sweaty hands, carrying something and the odds just drop even more because I am trying to multi-task in a life threatening situation. Put it all logically and you see how this adds up against a person being able to pull off much more than a whole body skill and therefore the only hope of success in REAL LIFE is in focusing on a fast and powerful disarm which uses gross motor skills. I mean no disrespect to anyone, but the IKXYZ (name changed) method is dangerous in real life. As a tactical operator I would never put myself or team mates in danger by using those methods.